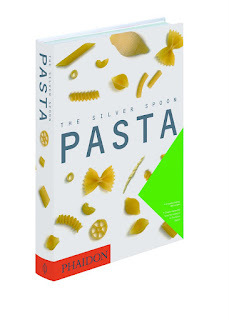 The Silver Spoon Book of Pasta is pretty much the only pasta cookbook you will ever need. If you are looking for delicious, authentic Italian pasta dishes, this is the book for you! It includes 350 mouth watering recipes. You can find very simple, basic recipes, along with more advanced, gourmet dishes. The book is filled with gorgeous color photos of the recipes, a feature I really enjoy in a cookbook. The recipes are easy to understand, so even a beginning cook could easily use this book. I've made three recipes from the book so far and all were meals I would be proud to serve to company. You can pick up your own copy of The Silver Spoon Book of Pasta online or at retailers nationwide. To make the filling, rub the ricotta through a strainer into a bowl and beat well with a pinch of salt and pepper. Put one-third of the ricotta into another bowl and beat in the spinach puree. Put half the remaining ricotta into another bowl and beat in the tomatoes. Leave the remaining ricotta plain. Preheat the oven to 350°F and grease an ovenproof dish with butter. Make a layer of lasagna in the base of the prepared dish, spread the spinach and ricotta mixture on top, and sprinkle with grated pecorino. Make another layer of lasagna, spread the white ricotta on top and sprinkle with pecorino. 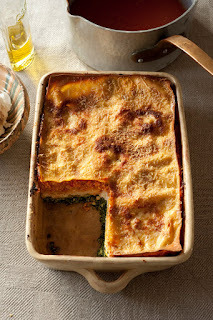 Make a final layer of lasagna, spread the ricotta and tomato mixture on top, and sprinkle with the remaining pecorino. Dot with butter and bake for 20 minutes. Serve immediately. Cook the broccoli in salted boiling water for 8 minutes, then drain. Heat the olive oil in a pan, add the garlic and chile, and cook for 3 minutes, then add the broccoli, and cook over low heat, stirring occasionally, for 5 minutes until tender. Meanwhile, cook the orecchiette in a large pan of salted boiling water until al dente, then drain, and toss with the broccoli. Serve with Parmesan or pecorino. 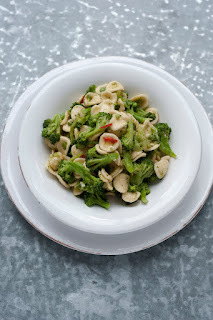 Tip: Alternatively, the broccoli may be cooked with the orecchiette. In this case, drain everything, then drizzle with olive oil, and sprinkle with the grated pecorino. This recipe works well with other types of short dried pasta, such as rigatoni. You really want this book in your kitchen, right? Well, you are in luck! One lucky reader will win their own copy of The Silver Spoon Book of Pasta. All you have to do to win is leave me a comment telling me your favorite pasta dish. This is mandatory for entry. *Follow on Networked Blogs. This is worth 5 entries, so leave 5 comments. Deadline to enter is 11:59pm CST on 12/11/09. Good luck! Well for College Girl it is Manicotti and me just any pasta with butter, salt and pepper. I love pasta with ricotta. My favorite past dish is Fettuccine Alfredo!! I love it. And it is so versatile. You can add broccoli, chicken, spinach, etc to it. I would really love this cookbook!! You can never have enough recipes:) Please enter me. Thanks!! And a follower on Google Connect. Stuffed shells with ricotta and spinach with marinara sauce. IM an email subscriber of YOURS !!!! We love homemade cheese raviolis. My favorite pasta dish is Baked ziti. You can't beat 'Spag Bol' on a cold night. I make it from scratch so it is full of goodness. I often use it as the meat sauce for my lasagna too. I love a Mushroom pasta dish I make with white wine, cream and onions. So good! I love Pasta Fagioli which is Pasta and beans. My favorite pasta dish starts off with minced garlic sauteed in a pan with olive oil (however much you'd like), and next add a carton of cherry tomatoes, each tomato halved. You can cover this or keep watch until the tomatoes seem sufficiently cooked. Then add as much basil as you'd like, cut into thin strips, and stir until the basil is just wilted. When the sauce is done, just add warm cooked pasta of your choice, and parmesan to the top to serve. So good and so fresh tasting in the summer! Lasagana is my favorite pasta dish! I have a recipe for whole wheat spaghetti with broccoli and chickpeas that's wonderful! Shrimp Primavera - a family favorite! Shrimp Fra Diavolo with fettucine is my favorite. My favorite dish is a Seafood Pasta with garlic and shrimp. I LOVE spaghetti - it's probably one of my all time favorite meals. MMM homemade pasta with olive oil, lemon juice and garlic. there is NO question my favorite is lasagna! I love baked ziti! Thanks! I love anything with the word fetuccini in it! Toasted ravioli (made properly) is pretty much a regional thing and every good Italian restaurant in the St. Louis are makes it properly. I love it. My favorite pasta dish is a Pumpkin Baked Ziti.